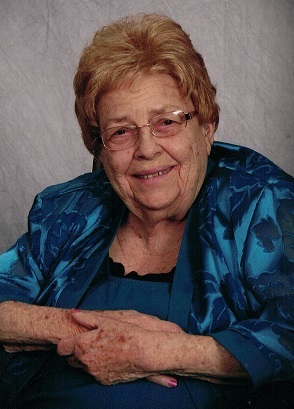 Irene L. Kelly, 98, died Tuesday, March 19, 2019, at The Gardens at St. Francis, formerly, Little Sisters of the Poor. She was born June 12, 1920, in Toledo. Irene was a graduate of St. Ignatius Elementary School, a 1938 graduate of Clay High School, and she attended Owens Community College. She was one of the first licensed nursing home administrators in Ohio. Irene opened Family Tree Manor Care in Oregon in 1979. Irene was a nursing home administrator for over 30 years, retiring in 1996. She was financial secretary treasurer for LCBA and secretary for the Alter Rosary Society at St. Ignatius. She volunteered at St. Charles for 25 years, where she was a member of the St. Charles Auxiliary. She also volunteered for Mobile Meals of Toledo, and the Red Cross. Irene was a member of the Oregon Senior Center. Irene’s musical gifts provided much entertainment for many to enjoy. She loved the color green. Irene is survived by daughter, Sharon Newton; grandchildren, Kelly (Doug) Vanderzwart, Kevin (Josephine) Newton and Kyle (Pamela) Newton; great-grandchildren, Jessica, Kody, Jennifer, Kara, Justin, John and Crate; numerous nieces and nephews. She was preceded in death by her husband, William Kelly; brothers, Martin Jr. (Betty), and Howard (Irene) Lehmann, and son-in-law, John Newton. The family wishes to thank the employees of Little Sisters for all their loving care and Hospice of Northwest Ohio. Family and friends may visit the Freck Funeral Chapel, 1155 S. Wynn Rd in Oregon on Sunday, March 24, 2019, from 2-7 p.m. Funeral services will begin in the funeral home Monday, March 25, 2019, with prayers at 9:15 a.m., then continue on with the funeral mass at 10 a.m. at St. Ignatius Catholic Church, 212 N. Stadium Rd., Oregon, OH 43616. Burial will follow at St. Ignatius Cemetery. Memorial contributions may be made to St. Ignatius Catholic Church or Mobile Meals of Toledo.